Now that I have discovered where [Fine Arts department, near the sheet music] the main branch of the library has stashed the knitting books, I am test driving The Knitter’s Book of Socks by Clara Parkes. I’m currently struggling with the same emotions I experienced when first reading Marcella Hazan’s Essentials of Classic Italian Cooking. How do you pick just one recipe to see if you like the book? Which sock is the one that will salvage my pink Lorna’s Laces yarn (it’s been tried on 2 sock patterns from other books already, and now I’m dithering between Stepping Stones, Isabella d’Este, or Darjeeling). The recipe that sold Classic to me was the chicken stuffed with 2 lemons, and I’m hoping to find something unexpectedly simple and fun in this test drive. 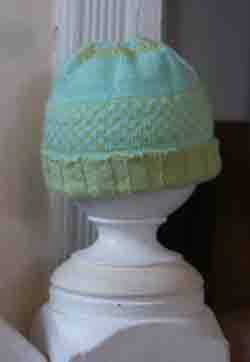 Today’s amateur* pattern is for a little 2-square baby hat (pattern section on the hat). Head diameter is for around 18″, so you may wish to size up in needles to adjust if the baby you’re knitting for is larger. I was knitting this for donation to a local hospital. *Note the word amateur. This pattern hasn’t been proofread or test knit. It’s just a recipe for what I did to make this hat. Other tools: 7 stitch markers (one in a contrasting color for row starts). CO: 140 stitches in the round. Join. Join in mc and knit plain in mc for 18 rows. 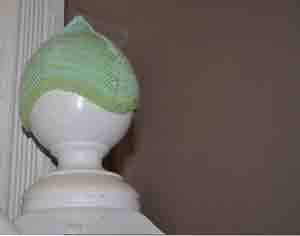 Join in cc color and knit with cc color for 1 to 2 rows. Rows 1 & 2: mc K2, cc K2. Rows 3 & 4: cc K2, mc K2. Pattern rows 13 & 14: mc K2, cc K2. Knit 1 row in cc, adding stitch markers every 20 stitches. 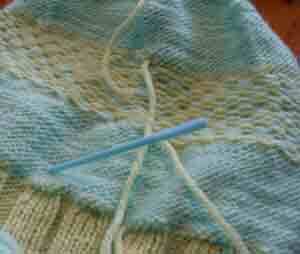 (It is helpful to have a contrasting color stitch marker for the beginning of the row.) 7 markers total. Switch to mc: Decreases begin. Decrease row 1: decrease stitches before and after each marker (14 decreases in total; 126 stitches left). Knit 10 rows. Decrease row 2: decrease stitches before and after each marker (14 decreases in total; 112 stitches left). Knit 3 rows. Decrease row 3: decrease stitches before and after each marker (14 decreases in total; 98 stitches left). Knit 3 rows. Decrease row 4: decrease stitches before and after each marker (14 decreases in total; 84 stitches left). Add cc. Knit 3 rows. Decrease row 5: decrease stitches before and after each marker (14 decreases in total; 70 stitches left). Add/switch to mc: Knit 3 rows. Decrease row 6: decrease stitches before and after each marker (14 decreases in total; 56 stitches left). Just weave in the ends, then put it in for a soak and lay flat to dry. Knit 2 rows. Decrease row 7: decrease stitches before and after each marker (14 decreases; 42 stitches left). Was sighted on a friends’ FB page, so I guess it’s safe to reveal the picture now. Sadly, not with a newborn in it (the hat is too big right now, and baby doesn’t need to be in a blog — the kid’s Mom should decide when the kid gets a closeup on the internet). The gracious Miss Banister has offered to substitute for the baby in this instance, to give you an idea. The pattern is adorable, although I got distracted and ended up futzing some of the bind offs once I started the decreases (here’s a sample by someone else, who did a better job of interpreting the pattern). You’ll probably be able to see it pretty clearly either here, or on the version on flickr. So, I have seldom ever knit anything without altering it or cobbling together some “fix” that seems good enough at the time but when I see it, the “fix” blazes with the white heat of a thousand, mortifying suns. (There’s at least one pair of baby booties that will never see the light of day. I just don’t think anything human could wear them. A goat, perhaps.) However, I think I might want to revisit the Sweet Norwegian Baby Cap, because it is a fun knit. More gift knitting underway as we speak. OK, I’m curious. What are you looking forward to doing once the Christmas preparations are all done, people have unwrapped presents, and you no longer have deadline knitting? Me, I have a pattern for mittens with birds on them. I have periwinkle and off-white yarn. And I have sticks. And I have very, very cold hands. Although I’ve recently heard enthusiasm from someone about what a pair of legwarmers could do in weather with snow above the bottom of the back door. So, after the tiny things created for tiny creatures are done… I will either have a case of finishitis and finish some of my other older projects. Or I’ll cast on for mittens. How ’bout you?